We offer convenient and flexible personal, business and student Edinburgh storage solutions, operating in a 25 mile radius of our storage centre in Newbridge on the west side of the city. But you don’t need to worry about finding us – we’ll come to you! Your things will be stored in a sealed vault the entire time, reducing the risk of damage significantly. Use our vault estimator if you’re unsure about how much storage space you need. 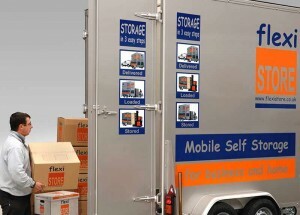 If you need access to your things whilst in storage, just let us know and we’ll organise it. We deliver packing supplies, either with your vault or, if you prefer, in advance so you can have everything packed and ready to load when the vault arrives. We also offer international shipping services if you need your things delivered abroad. How do I book storage in Edinburgh? Click on the blue button below to get a free storage quote. You can also use our enquiry form to send us a message. If you prefer to speak to someone, don’t hesitate to give our Edinburgh storage office a call on 0845 430 9333. Our Edinburgh store is located only 10 minutes from the City Centre and less than 2 minutes from Edinburgh Airport. From Edinburgh - follow the A8 dual carriageway past the Airport and Ingleston show ground. On entering Ratho Station the road changes to a 40 miles per hour speed limit. Take first left, signposted Ratho Station. Take first right into Harvest Road and then first left into Lochend Industrial Estate. We’re next to Fedex.